Great discoveries take time to change the world. GPS, now pervasive in our satnavs, phones and smartwatches, took a century to reach today’s advanced stage. The journey from Einstein’s 1915 Theory of General Relativity, which allows GPS-enabled devices to sync with satellite clocks, via many decades of multi-billion dollar investment from the US Department of Defense, to global ubiquity was long, complex and expensive. Many of today’s most awesome scientific and commercial opportunities, such as metamaterials and DNA sequencing, have taken decades to move from the lab to the market. This does not come cheap. Traditional investors do not have the time or deep pockets to cultivate such deep science. It takes visionary investors like IP Group, which has supported Oxford Nanopore since it was spun out of a university lab in 2005, to ensure groundbreaking high potential but high cost research is not squandered. That’s why ‘patient capital’ is so crucial to our future, but too often lacking in innovation ecosystems. It deserves more attention. This very long-term form of investment is emerging as a support mechanism for highly promising scientific ideas, augmenting traditional instruments such as government grants and contracts, angel investors and venture capital (VC). It’s the missing piece in the financing innovation puzzle. Patient capital fulfils a vital role in supporting university start-ups because of its ability to take a lengthy and systemic view that accords with the diversity, dynamism and risk of solving complex problems. The formative stages of start-up companies are usually funded by personal savings and debt, family, friends, and maybe some crowdfunding. Traditional funding of their early stages of growth follows a linear model starting with angel investors moving through various series of VC funding: seed, growth, mezzanine and into later stage funding, and private equity financing. Investor ownership is diluted following each successive round of investment unless they ‘follow their money’ by investing in each subsequent round to protect their stake. 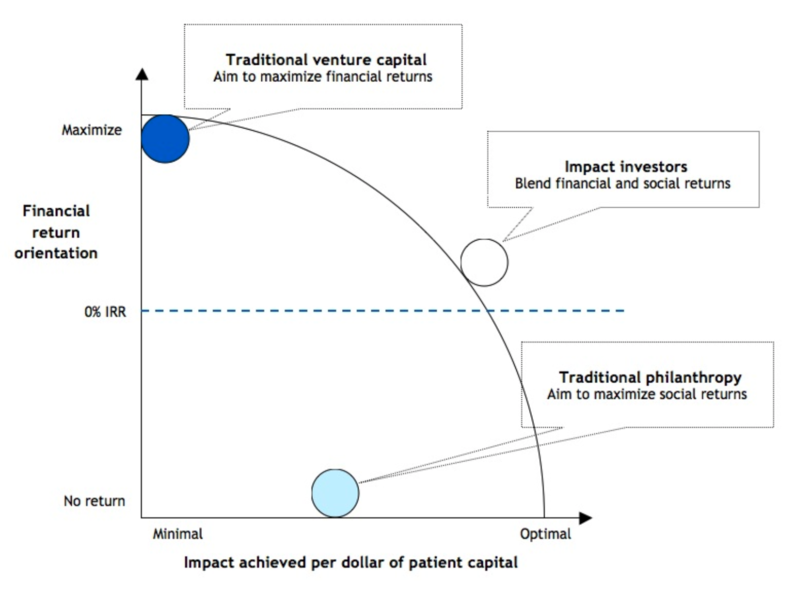 The patient capital model is different. It does not have a fixed investment period and spans across the stages of development from early phase to later stage scale-up and growth. These funds are open-ended, or ‘evergreen’, in the sense that returns are repaid back to the fund or company vehicle for subsequent reinvestment into new start-ups and their existing portfolio of companies to make returns over longer periods. They contrast with more traditional 10-year, closed-end VC funds which may come under pressure to force earlier exits to pay a return to the original investors within the life of the fund. As with VC, patient capital businesses ultimately still expect to achieve top quartile returns through dividends from revenue generating businesses, or one-off returns on capital from trade sales or initial public offerings. Some may invest for strategic reasons such as gaining exposure to high-risk/high-potential businesses or a particular emerging sector. Their investment gives them the opportunity to intimately understand complex new areas providing the option for subsequent investments when they have been significantly de-risked. Others invest purely for returns on investment, leading to NAV (Net Asset Value) and share price growth. University associated patient funds ideally have the ability to deploy capital over 10 or more years, and persist in backing their investments through every stage of growth, or round of funding, to create a sustainable model of financial support for growth. This approach avoids some of the tensions that can emerge in multiparty arrangements, especially where investor interests may not be aligned from round to round (due to the inability to follow-on in later investments). Some ventures may be handicapped in raising later rounds of funding if they have too many early-stage funders creating complex equity structures. Early stage seed capital investments often lack the resources to invest in capital intensive technologies, those with long gestations, such as biotechnology and aerospace, or those requiring extensive regulatory approvals. Angel investor and VC interests also tend to focus more on short-term exits which can divert attention of company leaders away from the long-term development of sustainable businesses. When VC does take a long-term time horizon, for example 7-10 years, it often requires that the company’s products have achieved proof of concept or have demonstrated market traction before investing, which is difficult for businesses in markets that have yet to evolve. There is huge diversity in the range of technologies and sectors that university start-ups target. Some, such as software and apps, may require limited amounts of capital and ideas can move swiftly to market. Angel and VC funding may be especially appropriate here, and the software industry attracts the most VC investment. But many deep science businesses may take years to create viable products in markets, and involve extensive development in specialist laboratories and complex regulatory approval processes. Evidence from the development of new therapeutics by pharmaceutical or biotech start-ups shows that moving from proof-of-concept through full clinical trials and approvals to the market takes time – between 7-15 years – and requires access to expensive, specialised facilities such as wet-labs and infrastructure for manipulating big data models. Creating new energy storage technologies, new forms of bio-degradeable plastic, applications for graphene, or synthetic biology systems for water purification also takes lengthy periods in lab-based development processes. Patient capital is particularly valuable in these kinds of development. Providers of patient capital may come in many forms and can include strategic corporate VC (which may be invested from balance sheet or via a fund). Some providers have a clear focus on university-associated science and technology start-ups and have accumulated impressive levels of resources. In the UK, they include IP Group plc, with a market capitalization of £1.3 billion; Syncona Partners, involving the Wellcome Trust, with £1.2 billion; Eight Great Technologies (8GT) Fund, which is Chaired by Lord Willetts, former UK Minister for Universities and Science, which has raised £800 million, including funding from China; and Oxford Sciences Innovation which has raised £580 million. They do not replace incumbent players, such as VC funds, but exist alongside them – the two are not mutually exclusive. Patient capital emerged in the UK in part because of the relative immaturity of its VC industry compared to the USA. The UK has neither developed the cohort of 'Super Angels' (ultra high net worth individual investors) nor University endowment backed Venture Funds (such as StartX from Stanford University): it is still developing the culture of philanthropic donations from alumni at the scale found in the USA. The requirement for patient capital was the topic of a recent UK Government Review, which recommends a plan to unlock £20 billion of new finance for fast-growth innovative firms over the next 10 years. This offers hope that momentum around patient capital can be sustained in the UK and other advanced economies. One of today’s most justifiably hyped fields is artificial intelligence. AI spent decades – pretty much the entire 1980s to 2000s – as an academic and business afterthought. AI researchers look back on this period, languishing in the so-called ‘trough of disillusionment’, as a time of underfunding, disinterest and obscurity. We cannot afford to neglect other high potential fields that require deep scientific research in this way – too many of them address great challenges that we need to solve. For example, creating sustainable sources of energy, dealing with the problems caused by climate change, tackling anti-microbial resistance to medicine, supplying fresh water and food and dealing with obesity and the growth of diabetes, solving problems of plastic waste, managing congestion in densely packed cities, providing security of personal data, or protecting critical infrastructure from cyber attack. These are just some of the complex challenges for which we do not have easy answers, but are the targets of major research efforts. The development and rapid growth of new ventures, born in or next to the laboratory, will be important contributors to creating and implementing new solutions to these problems, and can generate enormous economic and social value. Such new ventures are important elements of innovation ecosystems, comprising innovative private sector firms, backed by supportive government policies and universities that provide their ideas and the talent they foster, along with specialist infrastructure and facilities. Crucial in the emerging and evolving mix of different players in innovation ecosystems is the availability of a diverse system of finance to support the development of new opportunities – particularly the growth of ventures from deep science. This category of investment is still in gestation, and needs further proof of the returns it can produce. Given its potential it not only deserves more attention, it warrants a much deeper pool of investors, including pension funds and insurers. Founders of new businesses in science-based ventures need to overcome many hurdles, including creating markets that might not yet exist. They need to maintain momentum whilst also exhibiting patience, and they need patient sources of funding to sustain them while a new sector emerges. The risks may be high and returns may take longer, but as Swiss philosopher Jean-Jacques Rousseau said: although patience is bitter, its fruit is sweet. Tony Hickson, Managing Director Imperial Innovations, part of the IP Group, and John Anderson, Director Financial Strategy, Imperial College London.